> Money – Good or Bad? Money is a touchy subject. Many people equate richness with being rich, being wealthy, having a lot of money, and, often, with showing that money off. They think it is something outside themselves. But increasing numbers are starting to realize that without an inner richness, without the kind of resources money cannot buy, outer richness means little. “It is a touchy question because money is not what it appears to be. Money is more deep-rooted. Money is not just there outside in currency notes, it is something to do with your inner, your mind and attitudes. Money is your love of things; money is your escape from people; money is your security against death; money is your effort to control life; money is a thousand and one things. Money is not just concerned with currency notes; otherwise things would have been very easy. Money is your love of things, not of people. “Money is your love – love of things, not of people. The most comfortable love is of things, and because things are dead, you can possess them easily. You can possess a big house, a palace – you can possess the greatest palace easily – but you cannot possess even the smallest baby. Even babies reject, even babies fight for their freedom. A small baby, however small, is dangerous for the man who wants to possess him. He will become rebellious and he will rebel, but he will not allow anybody to possess him. “People who cannot love other people, start loving money because money is a means to possess things. “The more money you have, the more things you can possess; the more things you can possess, the more you can forget about people. You will have many things, but you will not have any contentment because deep contentment comes only when you love a person. Money will not revolt, but it will not respond either, that’s the trouble. “That’s why miserly people become very ugly (nobody has ever responded to their love. How can you be beautiful without love falling on you, without love showering on you like flowers – how can you be beautiful? You become ugly. You become closed. A man who possesses money, or tries to possess money, is miserly and will always be afraid of people because if they are allowed to come close to him, they may start sharing. If you allow someone to come close you, you also have to allow some sharing. “People who love things become like things – dead, closed. Nothing vibrates in them, nothing dances and sings in them; their hearts have lost the beat. They live a mechanical life. They drag, burdened, burdened with many things. They don’t have any freedom because only love can give you freedom, and love can give you freedom only if you give freedom to love. “People who are afraid of love become possessive about money. People who love become nonpossessive, money doesn’t matter so much. If it is there, it is okay, it can be used. If it is not there, that too is okay because love is such a kingdom that no money can purchase it. Love is such a deep fulfillment, you can be a beggar on the street and you can sing if you have love in your heart. If you have loved and you have been loved, love crowns you, makes a king of you. Money simply makes you ugly. I am not against money. 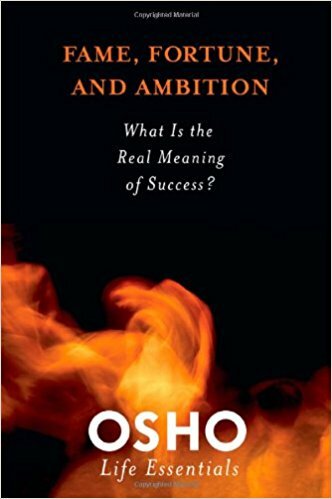 Suggested reading: OSHO: Fame, Fortune, and Ambition: What Is the Real meaning of Success?